Cascade Cottage in Exmoor is a gorgeous rural retreat for up to 6 people (three bedrooms, two doubles and one twin), half a mile from the central Exmoor village of Exford. This is an ideal location to explore Exmoor from! Cascade Cottage in Exford takes its name from the cascade of water that runs from the lake on the hill above the cottage; Edgcott Water fills the lake then passes under a wooden footbridge directly outside the front door. The cottage sleeps up to 6 guests in three bedrooms and is conveniently located approximately half a mile from the centre of Exford in the heart of the Exmoor National Park. The front door opens into the spacious kitchen with large dining table; the sitting room has two leather sofas, two armchairs and a wood-burning stove. There is also a utility room and downstairs toilet to the rear of the property. 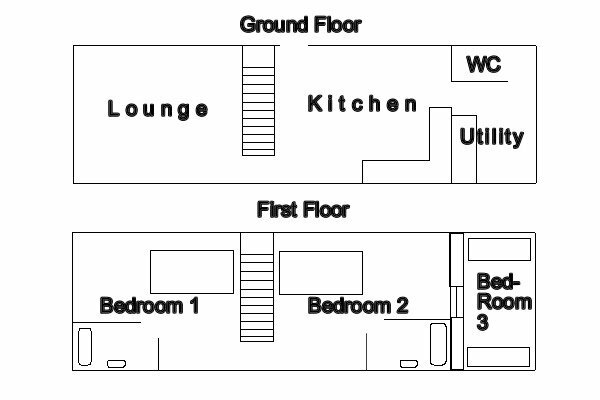 Upstairs are two double bedrooms (one with a king-sized bed and one standard double), both with en-suite bathrooms comprised of shower over the bath, toilet and hand basin. 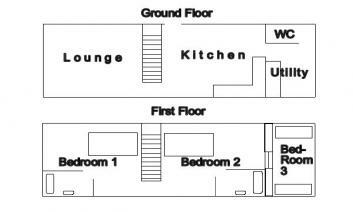 The third bedroom is a twin, which is accessed via one of the double bedrooms. A security deposit of £50 is required when booking this property. This will be added to the total price of your booking, and will be refunded after your stay unless the owner discovers damage to the property or its contents after your departure. Cascade Cottage is strictly non-smoking. The centre of Exford is a 10-minute walk. Here you will find two pubs that serve lunch and evening meals, and a tea shop. There is also a village shop that sells various essentials, and also contains a Post Office counter where you can get cash. Waitrose, Sainsbury's and Tesco will all deliver to Cascade Cottage so you can take away the worry of bringing all your food with you. Cascade Cottage is available for week-long bookings, short breaks may be available. Cascade Cottage kitchen has all you will need to make your stay comfortable. It is fitted with an electric cooker, microwave, fridge, and dishwasher. There are also  a kettle, toaster and a food processor. There is all the china, cutlery and glasses you will need for your stay. The utility room has a washing machine, tumble dryer, fridge/freezer and belfast sink. There is a television (with Freeview) and DVD player in the sitting room and wireless broadband is available throughout the property. A hair dryer is provided for your convenience. Electricity and heating costs are included in the price of your accommodation. Cascade Cottage has central heating which will be can be adjusted to suit your preferences. There is also a wood-burner in the sitting room; a basket of logs will be provided. Bed linen, duvets, blankets and towels are provided for your convenience, but please bring your own beach towels if you wish to take towels with you away from the property. A cake is provided for your enjoyment on your arrival plus a loaf of homemade bread, a jar of homemade jam, some butter and milk is also included for you as well as tea, coffee and sugar. A starter pack of “Ecover” cleaning products will be provided to get you going, and one to two toilet rolls will be provided per toilet. A travel cot and high chair can be provided upon request and for a £15 supplement. Please select this option at the time of booking in order to ensure they will be available for your stay. The stream runs in the front cottage, which is fenced and planted with shrubs on the banks either side. A footbridge crosses the stream and leads to a lawned area of garden with table and chairs, the prefect spot for eating breakfast in the morning sunshine! There is an enclosed courtyard to the rear of the cottage which can be used for letting your dogs dry off or cool off, depending on the season. There is off-road parking in close proximity to the cottage for two cars. Please park on the drive in front of the cottage and a second car can be parked in the car park on the left as you enter the drive. The centre of Exford is a 10 minute walk from Cascade Cottage. Here you will find two pubs that serve lunch and evening meals, and a tea shop. There is also a village shop that sells various essentials, and also contains a Post Office counter where you can get cash. Waitrose, Sai...nsbury's and Tesco will all deliver to Cascade Cottage so you can take away the worry of bringing all your food with you. Exford is situated pretty much in the centre of Exmoor offering great access to all that Exmoor has to offer. It is a small rural village based around a traditional village green with children play area, beside it sits the village shop and post office. Exford and the surrounding area is famous for its beautiful and unspoiled countryside making it ideal for hiking, biking, riding and fishing. Just 10 minutes from Exford is Alderman's Barrow, just one example of the opportunity explore an incredible Bronze age Landscape, with it’s mysterious stone settings, barrow and hut circle. A footpath runs from Alderman's Barrow to Larkbarrow which is the ruins of an isolated farm that was used for firing practice during World War II. This area is described by Exmoor National Park as being surrounded by miles of open, rolling grass moorland, and one of the best places to experience remoteness and tranquility on Exmoor. Idyllic location surrounding by streams and waterfall. Very close to village. Cottage was exceedingly well equipped. It was lovely to be treated to a huge home baked cake, fresh bread, eggs, jams, milk and butte on our arrival. Beds were very comfortable, bath towels soft and bed linen fresh. Perfect. Absolutely beautiful cottage, faultless. Everything you could need. Great quality bedding, towels, crockery etc. The cascade is enchanting. Welcome pack was very generous with a fab homemade cake! Can't rate it highly enough. Fantastic cottage with everything you need, plus more. Location was just right, only a small walk to the village centre. Geoff didn't write a comment. Lovely, very well equipped cottage. Close to owners guest house but felt very private. Really appreciated the homemade jam and marmalade, the bread eggs and the beautiful sponge cake! !